Yes it would be possible to add a button to a BlinkM, but there’s not enough pins so you would either a) be okay with losing one of the RGB colors, b) be okay with occasional spurious I2C traffic as you use an I2C pin as a button input, or c) use HVPP programming mode to re-use the RESET pin as an input. 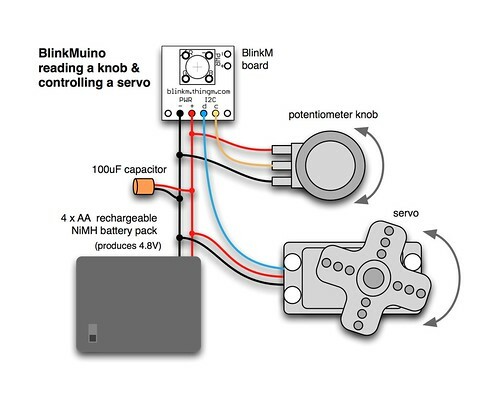 I looking for a solution to combine a led with a button, controlled by a main Arduino for processing. I would like to use as less wires as possible. Could it be possible to use the solution you provide with the RGB led and adding one button. I would like to receive the button data by i2c and send led colors with i2c. Is there any reason why loading a library such as servo.h won’t compile? Great project Tod! Thanks for sharing! I’m using a group of MaxM’s in series, and send commands via the main interface. Can the “input” pins on the MaxM be used as outputs to drive a couple of servos, or are they input only as the name implies? What a cool bean project! Hey your diagrams/illustrations are beautiful. This is a great, fun project, can’t wait to do. Thanks! oh thank you so much! Im pretty sure that was the problem! again thank you so much for this awesome software! It’s people like you that have inspired me to go to school for engineering and combine my passion for art and engineering to create amazing things! First thing to try is make sure you’re using the older Arduino 0023 and not the latest Arduino 1.0. Arduino 1.0 makes some changes to the underlying aspects of Arduino that I haven’t yet had a chance to test. nevermind i got it! thanks! 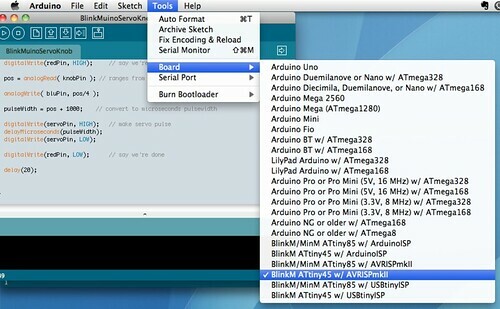 I cant seem to get the arduino IDE to add the binkm boards to the tools -> board menu. 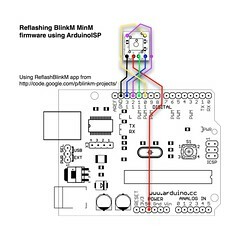 im doing exactly as you said, copying the hardware folder from the blinkmuino folder into the arduino folder and then changing the sketchbook location to the blinkm folder and restarting the arduino IDE. ive tried several times and its just not working. any ideas? 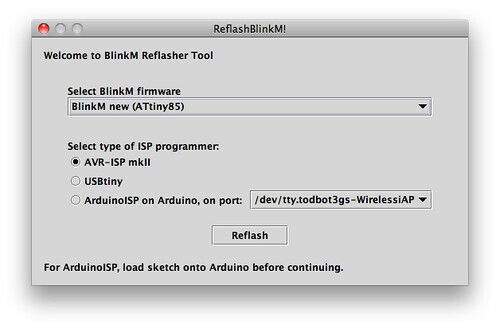 You can’t imagine how happy I am since I found your ‘Blinkmuino’ project. So many small projects I didn’t build because an ATMega was overkill. work on this mini ‘arduinized’ board. If you turn your BlinkM board into an Arduino you lose the BlinkM functionality. So you’d have to recreate that functionality yourself. Depending on what you’re trying to do, this might not be that big of a deal. And it does mean is you could store your sequence in the flash ROM as part of your sketch code instead of using the rewrite-able EEPROM BlinkMs normally use (which is a much smaller amount of memory) You might even want to write a more memory-efficient way of storing sequence steps instead of the 5-byte format BlinkM uses. 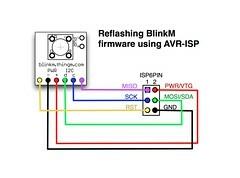 Could turning a BlinkM into an Arduino allow longer light scripts than the default 49 commands that the BlinkM provides? I ask because I’d love to program something much longer and keep it self contained. Thanks. On the PWM issue, I was sure I had it going, but then it was late at night and who knows what I did, I could have been using your BlinkMuinoFade sketch without realizing it… sorry if I confused @craig. BTW, now that I can program them easily like an Arduino my thinking gears are spinning fast and I started working on another idea on how to use my other BlinkM: I was thinking of turning it into a water indicator for plants; my main concern was battery consumption and after I started experimenting with a combination of solar cell charger and joule thief combination I realized that the BlinkM might be overkill for this one and it could be used for something more ‘worthy’. So, although I really like the size of the BlinkM, I might substitute it for a stock ATtiny with a standard LED, I will let you know if I decide to stick with the original plan.